Sam Steinberg is leading the team in points with 9 goals and 8 assists. Dan Serpe (5 goals, 4 assists) and Ethan Koval (4 goals, 2 assists) have also been big contributors. The defense, led by Greg Schebece and goalie Jordan Lafauci, has had 8 shutouts this season. Overall, the T-Birds are currently ranked #1 in the county, #2 in the state, and #15 in the country. 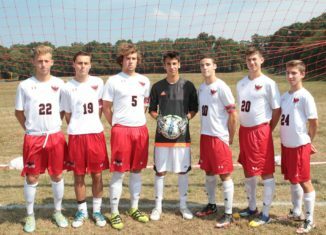 The Varsity Soccer team has impressed the school with their great playing this season. Good luck to the boys for the rest of the season. Bring home a victory for HSE!